I haven't made Cornish pasties in years. The weather here has already shifted into pre-winter chilly and wet so maybe I should remedy that one day soon. Nice one Anna! Do I recall l that saffron is an ingredient in Cornish pasty? Or is that in another dish from Cornwall? Certainly not in what is considered the official recipe which lays down the contents as potatoes, rutabaga, onion and skirt steak. Salt and pepper are the only recognized seasonings. Ah now I think I remember there's a saffron bun or something, a sweet. Same Art of Eating article! The dough recipe seemed very vague and not in the least bit intuitive. I wasn't even sure whether they were calling for a stand mixer or a food processor to be honest. I tossed the flour in the bowl of the stand mixer added the fat which was shortening and butter, the salt and the water. I let it mix with the beater blade for a while then changed to the dough hook and let it go until I had something that pulled away from the sides and bounced back just a little when poked. I wrapped this in plastic and threw it in the fridge where it remained for some 4, 5, or six hours. I then cut off a piece of the dough and it rolled out like a dream. It was sturdy enough to handle the filling and yet not tough when it came time to eat it. I wouldn't call it a tasty dough. It was definitely utilitarian but it picked up some of the flavor from the meat and vegetables. I'll have to take a peek at this recipe. I've only made them a few times and always used the recipe from Bernard Clayton's The Complete Book of Pastry. I've never branched out from there to see how others do them. He talked about the primary pastry requirement being durability in the early recipes but made concessions to being enjoyable to eat with his recipe. As I said, it's been a long time since I made them... but I seem to remember enjoying them. Sift flour and salt into large mixing bowl. Cut in lard with pastry blender until the mixture becomes crumbly. Add ice water gradually to make a soft dough. The less handling of the crust the better. 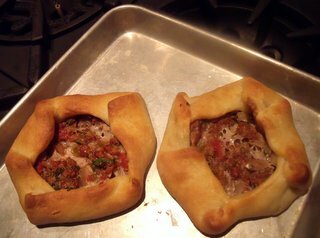 Dough may be made ahead of time and placed in a bowl with a damp cloth covering the top. Cube beef and pork into 1/2" cubes (or have butcher cut) Peel potatoes, onion and rutabaga. Cube or slice veggies, place into separate bowls. Cut dough into 12 portions. Roll each portion on a floured pastry board until about the size of a dinner plate. Place finely cubed onion onto one side of crust first. Add meat, salt and pepper to taste, then potato and rutabaga. Add a dab of butter on the top. Bring top portion of crust over. Seal with water on the edges. Crimp and roll edges around the bottom portion. Cut slits in the top. Bake on a lightly greased baking sheet, leaving a little room between each pasty for even browning. Bake in preheated oven, 425 degrees for 45 minutes. Remove from the oven and place a clean tea towel over pasties. Let set for 10 minutes before serving. Sometimes I will make this up in a 9"x13" pan with crust on top instead of into individual portions. In the Wisconsin area this is coyly called "pastum". There is a company in Anaconda MT that still makes these up for retail sales and they're found in two sizes in the freezer section of most of our grocery stores. They are surprisingly good and quite authentic. THIS appeared in my email today and reminded me that I used to make a "Wellington" galette, loosely based on Beef Wellington. I use about 12 sheets of phyllo dough to make the crust and if I am feeling ambitions, smear some of the duxelles in between a couple of "layers." It consisted of beef cut into small pieces, sauteed in browned butter with a little garlic and incorporated into a galette with confit onions and mushroom duxelles - on which I posted a photo essay some 9 years ago. HERE It looks complicated when you read the recipe in a cookbook but the execution is actually very simple which is why I did the step-by-step photos. The nice thing about making a batch of duxelles is that it can be used in many other applications. On toast topped with a poached egg, as a component in bruschetta with anything from smoked trout to chopped hard-boiled egg to slivered chicken or ?? 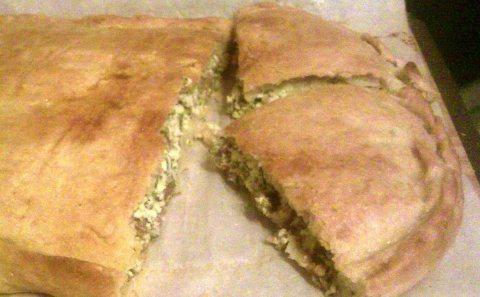 Recipes for the filling and yogurt-based dough came from Paula Wolfort's The Cooking of the Eastern Mediterranean. Easy and very tasty. I love lamb and those look delicious. Today I woke up with the idea that I had to make some muffins. 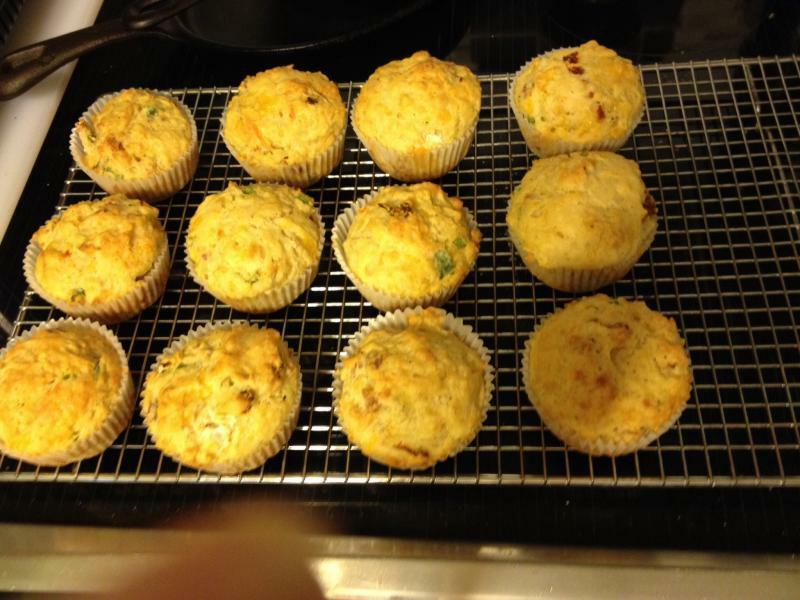 Was not much interested in sweet muffins so I made these savory ones. 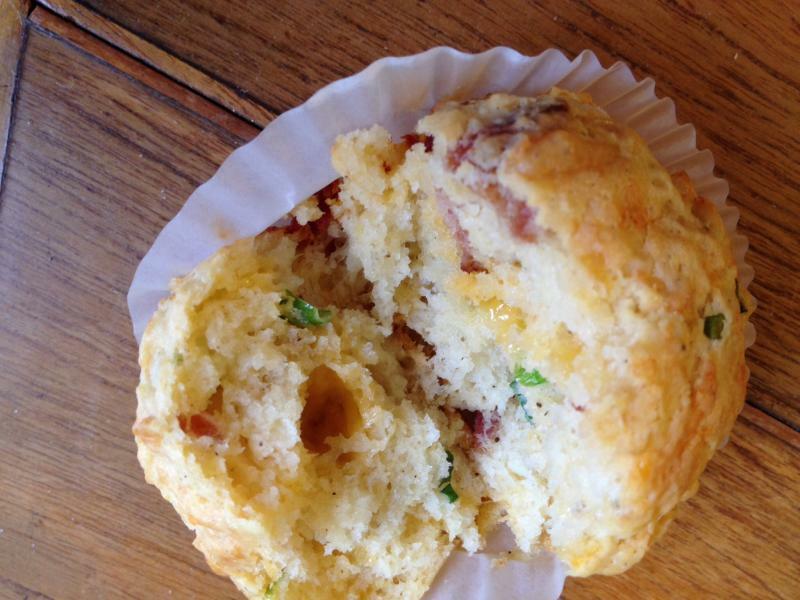 I used cheddar, Gruyere, minced scallions and sun-dried tomatoes. Ooh, those muffins look like an idea worth keeping, especially since we may be on the hook for breakfast for two dozen in a couple of weeks. Being the type of person I am, I wonder if they'd work with some crunchy bacon pieces added, and then maybe using the rendered bacon fat in place of an equal amount of whatever other oil or fat was included?
""" I wonder if they'd work with some crunchy bacon pieces added """
everything works w crunchy ( real ) bacon pieces added. Damn Melissa and rotuts! They DO have bacon bits. I I just forgot to list them. I had a few rashers already cooked in the refrigerator. I crisped them up in the microwave, chopped them and added them to the muffins. Nice muffins. One of them would hit the spot right now. Last night I made gougères, a savory version of choux puffs that includes cheese. I used a mix of emmenthaler and parmesan. I always add a generous pinch of cayenne pepper, which isn't enough to add any heat but it does boost the flavor. They're very nice as a nibble with drinks and people always love them. Alas, I forgot about photos, too busy getting the rest of dinner together before guests arrived. 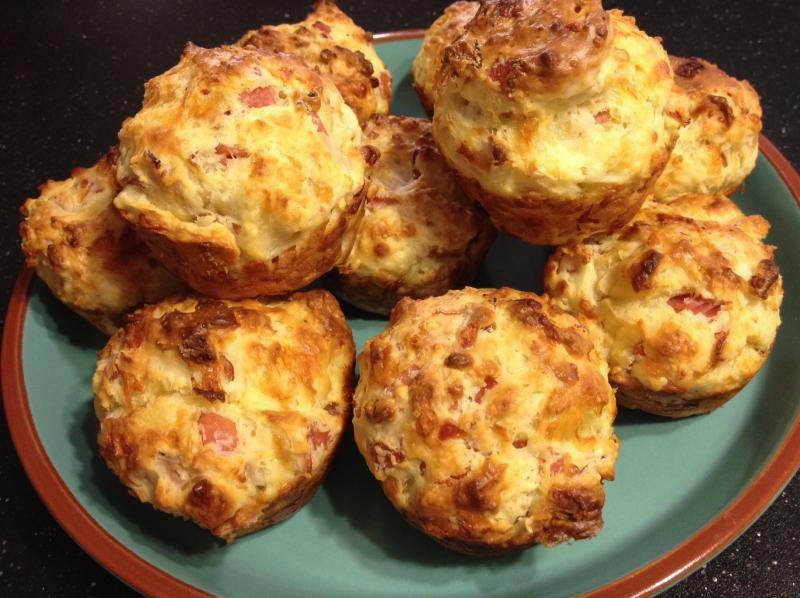 Bacon, onion, gruyere and cheddar muffins for my bachelor son. He freezes them and has an instant meal when he's too lazy (or too tired) to make anything else. A couple of these re-warmed and buttered and washed down with an ice cold brew makes it easy to swallow yet another night when his team loses the hockey game. Alas, I dont have it now ! One was about what you have done Above. made OutStading Toast on my Old GE "toastmaster" that took me through many years. The inspiration came from Nigel Slater. In Kitchen Diaries II he discusses having bits and pieces left that don't quite make a meal. He was very fortunate to have some high-quality ham and a nubbin of artisinal cheese. He combined these with a grated small apple and some yogurt and made muffins. 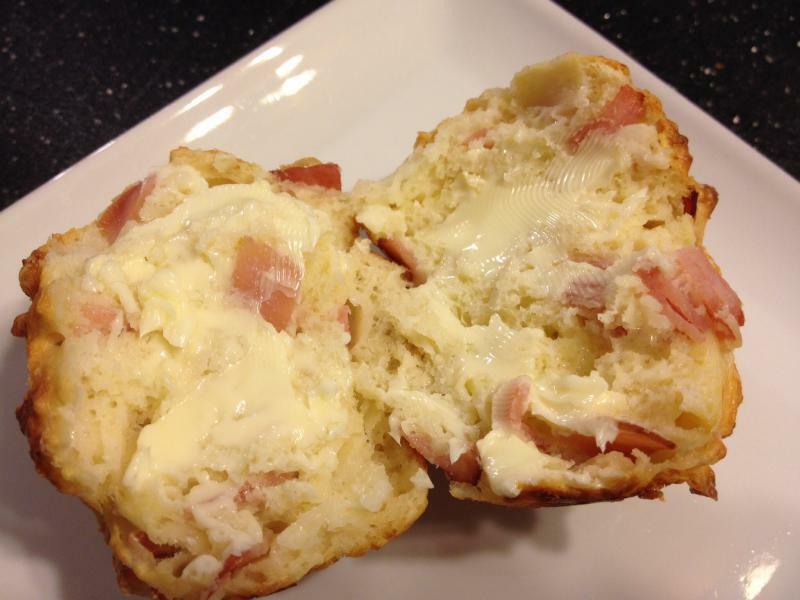 My ham was of less than spectacular quality as was my cheese but when combined made perfectly satisfactory muffins. These will go into my freezer for my version of an instant breakfast. And I will squirrel away the notion that many things can go into a muffin. 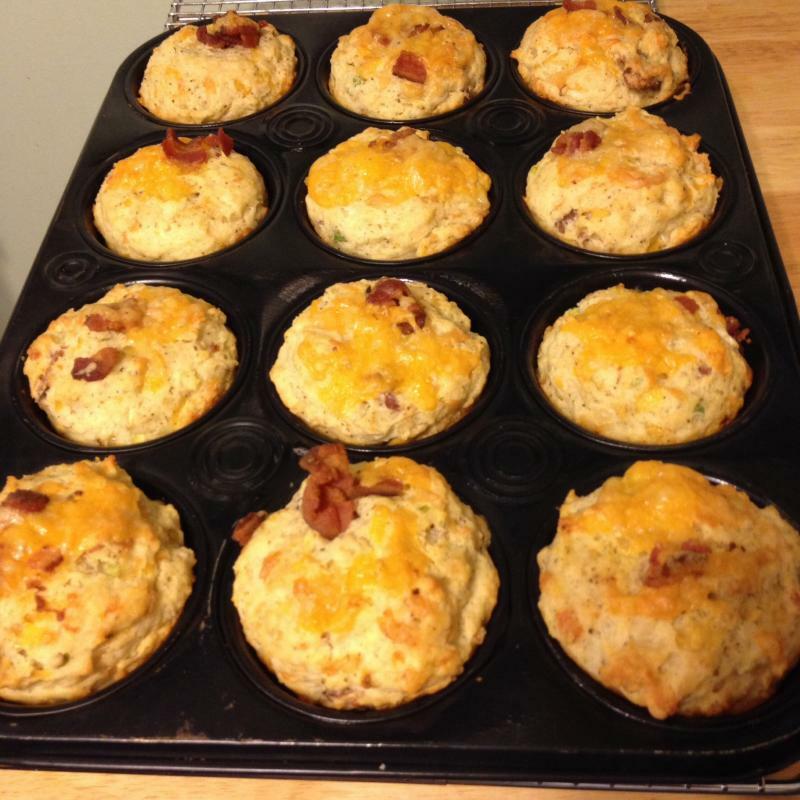 He called for paper muffin cups but I prefer to grease the muffin tin whenever I make savory muffins. You get that lovely crispy exterior which sure beats peeling off paper! Im also a fan of N.S. can you post where the Ref. Is ? but its quite a bit Bereft not having a Few of the Above. split with a cheezie, not to cheezie,but full flavored cheezie white sauce ? aged a bit at home ? It's from Kitchen Diaries II. I can't give you a page reference as I have the Kindle edition but it shows up in the month of May. Found a large chunk of gruyere in the cheese keeper that had been ignored for too long. 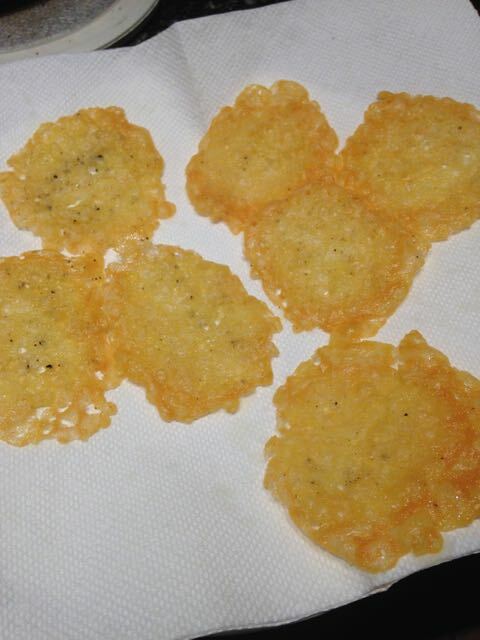 After refusing to pay $8.99 for a couple of small parmesan crisps today at Whole Paycheck - it seemed an omen. 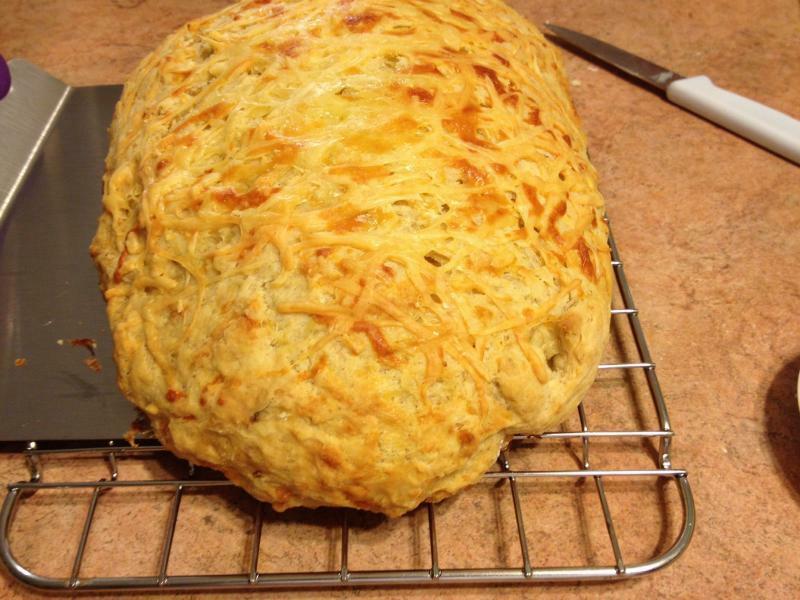 Beer, cheese, roasted garlic quick bread. Oh, dear God, Anna, that bread looks perfectly lovely. Here's a calzone from a while back. Pizza dough (Mark Bittman's recipe), ricotta, Italian sausage, parsley, basil. Oh my! That would be perfect for a Superbowl party! Care to share the recipe? Combine all ingredients except one quarter cup of the cheese, the melted butter and the sage leaves in a large bowl. Stir it to form a soft dough. Shape into an oval, brush with the butter, sprinkle on the rest of the cheese and arrange the sage leaves decoratively. Bake on a parchment-lined cookie/baking sheet 45 to 55 minutes or until it passes the toothpick test. To make sure the garlic was well distributed I added it to some of the beer and just gave it a few whirls with a stick blender before combining it with the rest of the beer and the other ingredients. I used a combination of cheese bits that were in my fridge and that included smoked cheddar, Gruyere and heaven only knows what. I dislike sage so that made no appearance. I think we'll have to have a Super Bowl party just so I can make this bread. Thanks, Anna! Thanks, Anna N! Can't wait to try it - might not even wait till Super Bowl!